Sheds | Bavarian Cottages Ltd. The method in which sheds are built is the same as our cottage line, very quick and easy ! Why buy one of our sheds ? Well that's a great question ! If you look at what's available it will become very clear what makes our sheds clearly superior. For starters unlike most sheds we use top quality lumber. Our shed kits are finished once erected. 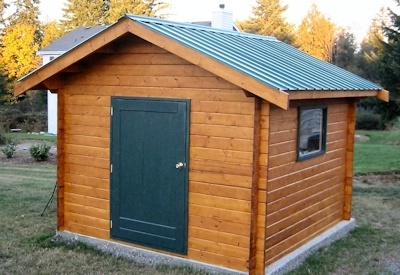 Most other sheds require hours of labor and hundreds of dollars to finish with siding and finishing. Our sheds are finished on the inside as they are being built. Another benefit, because most sheds are still completely unfinished and unattractive on the inside. Look at the other benefits listed below and remember, other sheds and structures only look like a bargain until you have to finish them !!!! Make the smart choice and give us a call we can explain all the benefits in more detail. Door comes in natural color in your kit, all painting or staining is done by you. 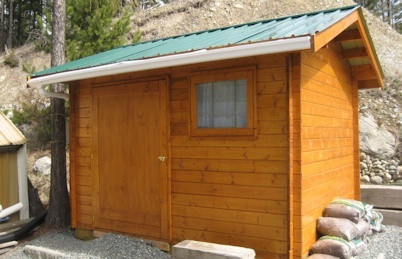 Shed specifications - the price list below is for sheds that look like picture on the top left - the shed with the painted green door (yours comes unstained and unpainted ) . All other sheds are custom so please contact us with what you are looking for or which design you like and we can quote you a custom price today. 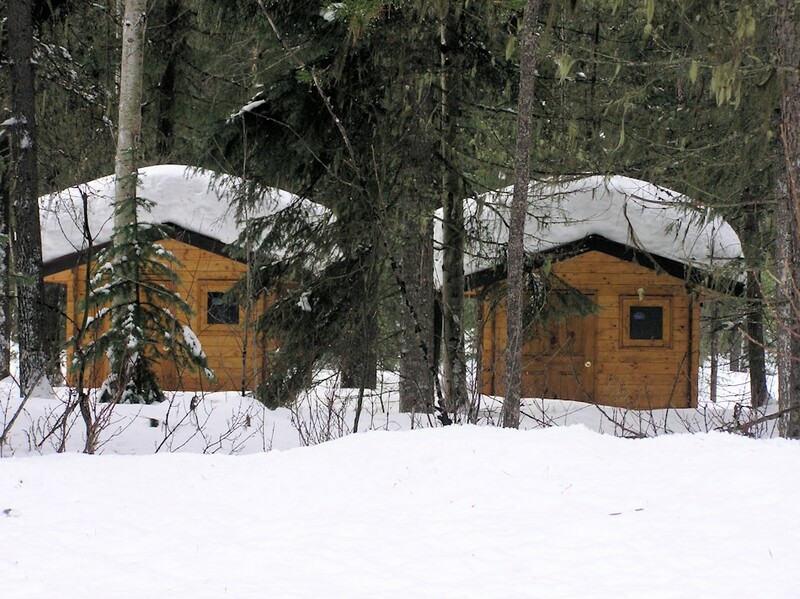 * Our sheds have an approximate side wall height of 72.5" inches and have an approximate peak height of 90" inches, which means if you are 6ft tall, you can stand inside the shed. The door is 32" wide and 66" high. The frontal overhang is approximately 13.5" inches. For security reasons these units do not have windows. A 25"x25"window may be added at an additional cost. The shed above represents how our sheds are built. Door in front and centered. This example features an optional window, which can be placed on any of the other three walls as well. 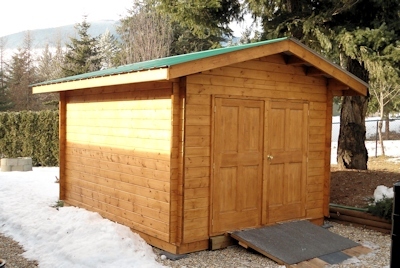 Due to the pricepoint of these sheds, wall heights and roof pitch are not able to be altered. If you need a taller wall, steeper pitch roof or any other change, you will need to order our cottage kit. All of our cottages kits are completely customizable and include the necessary design work in the price. 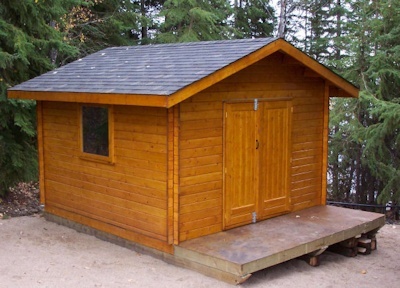 There are many differences in our cottage kits that differentiate them from the sheds. Please visit our cottage link for more information. Unlike most sheds, shelving, hooks, and other fasteners can be mounted nearly anywhere. No more looking for studs or nails sticking through the walls to cut your hands on. Shed 6x8 ( 1.83m x 2.44m ) BLC Shed 0048 please call for best current pricing. Shed 8x12 ( 2.44m x 3.66m ) BLC Shed 0096 and supply costs ! * Specifications subject to change. Although every effort is made to ensure accuracy, we reserve the right to make changes and/or corrections as needed. Please note that all sheds come unstained/unpainted. All hardware for the kit such as screws, nails ( if applicable ) are included.